Spanish part time course is structured for students who want to learn the Spanish Language at a faster pace. This course consists of 10 hours per week, 2 hours per day. You can choose your schedule. Spanish part time course is designed for people who want to learn Spanish but have only limited time. You can take this course in the morning, afternoon or night. Our method is based on the four main skills: speaking, writing, conversation and grammar,combining these skills of grammar with intensive conversation. All lessons will be referred to important and useful topics for you to maintain smooth communication while you stay in our beautiful city of Cusco. Lessons: Grammar, writing exercises, oral exercises and conversation. Individual classes: Above all the teacher’s attention will be totally focused on you. Group classes: Our groups are small with a maximum of 4 students per class. Our lessons are characterized by being referred to important and useful topics for you to maintain smooth communication while you stay in our magical city of Cusco. Spanish part time course are available all the year, with the possibility of starting the course each week. In our school we perform activities such as dinners, salsa lessons, city tours and many more activities. Wiracocha Spanish School also offers an accommodation service being an advantage for our students and enabling them to join group conversations so as to learn more. Wiracocha School also offer tourist packages to visit tourist attractions of Cusco, to see our packages click here. Apart from the Spanish part time course, we also offer other lessons, to see more courses click here. 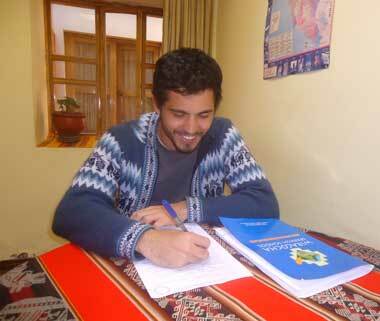 In our school we are prepared to offer you the best courses to learn the Spanish language with the best teachers. In conclusion, Wiracocha Spanish School is the best option for you learn Spanish quickly!